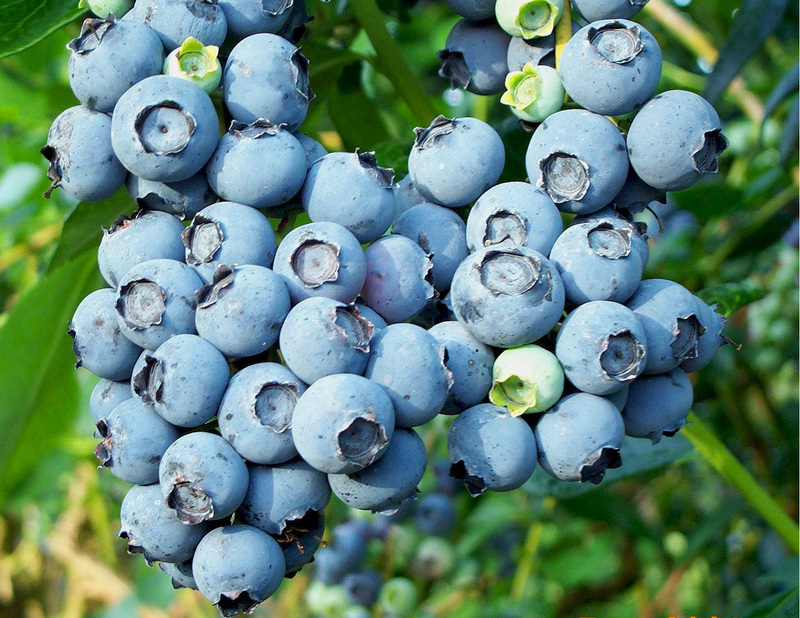 Did you know that the month of July is National Blueberry Month? With blueberry season in full force and lasting till the end of August now is the time to take advantage of this wonderful blue gem. And when I say gem, I mean it – most of the power found in these little berries come from it’s deep rich color. That deep-blue hue is a by-product of flavonoids — natural compounds that protect the brain’s memory-carrying cells (neurons) from the damaging effects of oxidation and inflammation. Since blueberries are one of the best sources of flavonoids you can find, it’s no surprise that this superfood has been shown to help preserve memory function. Blueberries also have a high water content helping to keep you, your cells and skin hydrated during this sticky summer month. 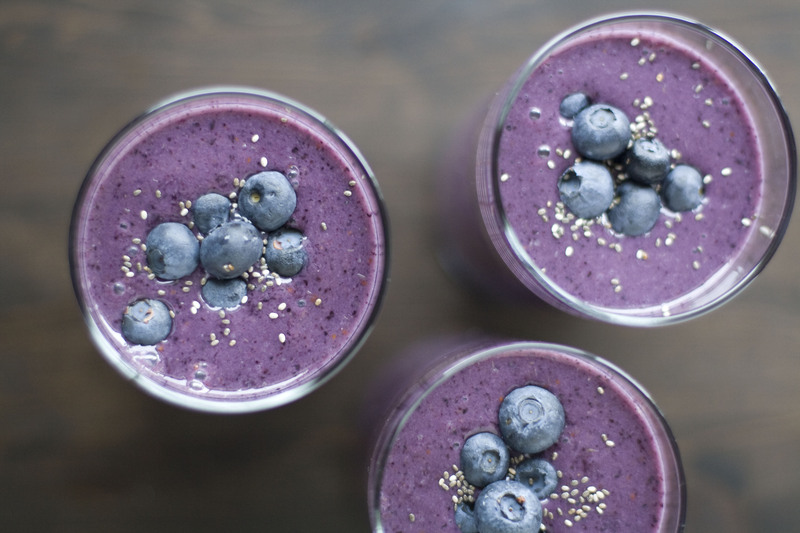 Keep yourself hydrated this morning with a Blueberry Dream Smoothie…it will definitely leave you wanting more berries! After a day spent in the sun and drinking dehydrating beverages (anything containing caffeine or alcohol), most of us can use a little TLC after a holiday like today’s Independence Day. Plus, chances are you’ve got even more celebrating up your sleeve for the weekend. Take some time in between party hopping to sip on this smoothie to refuel and rejuvenate so you can stay festive all weekend long! 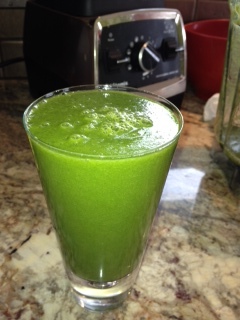 Bonus add-ins: 2 handfuls spinach, cucumber, cacao powder, pomegranate juice, or avocado. It’s in our food, beverages, chocolate, perfume, soaps, and is even known to lure not only humans but deers as well. Last but most certainly not least vanilla helps to lift spirits, calms you down, and can even help you lose weight! 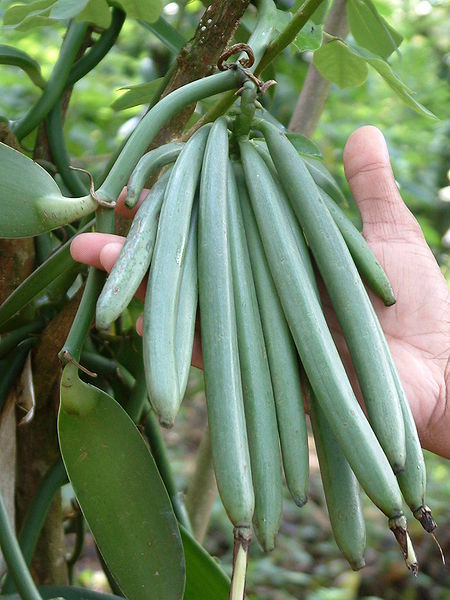 Vanilla is a flavoring derived from orchids in the genus Vanilla native to Mexico. 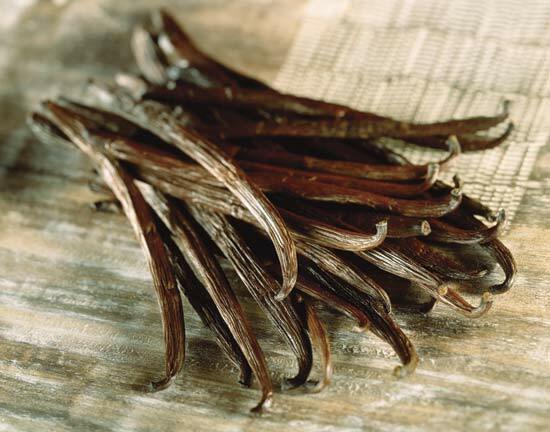 The name “vanilla” comes from the Spanish word “vainilla”, meaning “little pod”. Traditionally, Mayans used vanilla to flavor chocolate drink centuries before Spanish first arrived in Mexico in 1520. This highly prized bean is native to tropical rain forest of Central America and more recently spread to other tropical-regions by Spanish explorers. Being an avid fan and maybe slightly obsessed with using vanilla in many of our smoothie recipes, I was excited to learn a thing or two about the origins of vanilla and it’s associated, if any, health benefits. Along with the history, lure, and fun facts I found about this somewhat scandalous bean I was pleasantly surprised about its associated health benefits. 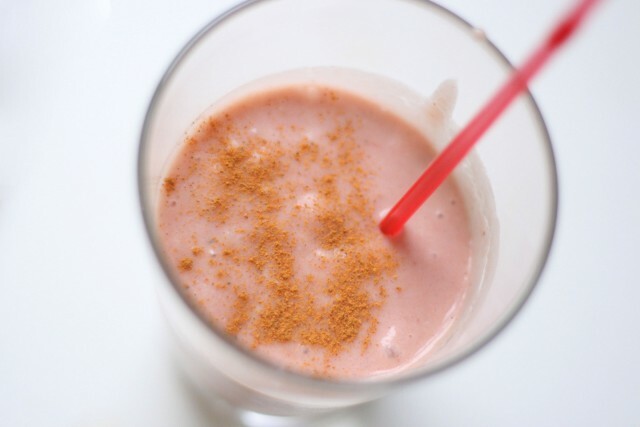 Also, we’ve included a spring-time nod to vanilla and rhubarb with a delicious new smoothie recipe. Enjoy! Vanilla’s anti-carcinogenic property primarily comes from the chemical compound vanillin, a polyphenol known to be a powerful antioxidant. The essential oil of vanilla has been shown to reduce free radicals thought to promote the development of inflammation and certain cancers. Other compounds in pure vanilla extract that display mild antioxidant or anti-inflammatory properties include eugenol, caproic acid, phenol ether, carbonyl compounds, esters, lactones and vitispiranes. Vanilla as a low calorie sweetener. Pure vanilla bean extract isn’t very sweet, especially compared to artificial and refined sugars, but its unique flavor can enhance the taste of baked goods, smoothies and coffee and reduce the need for additional sweeteners. As such, vanilla extract can be considered a lower calorie sugar substitute. 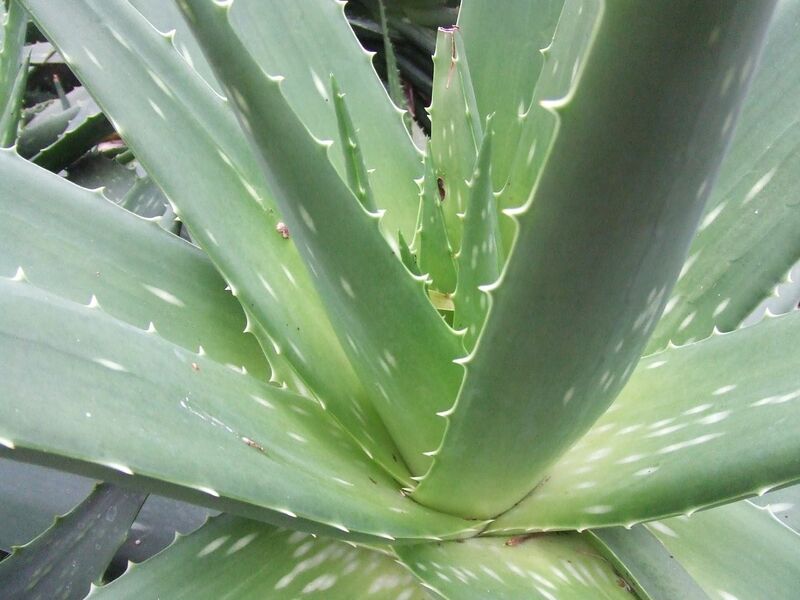 The natural extract contains many B vitamins such as B-1, B-2, B-3, B-5 and B-6. B vitamins are important for metabolism and energy production, as well as the synthesis of enzymes. Real vanilla bean extract also contains many minerals in trace amounts such as calcium, magnesium, potassium, manganese, iron and zinc. These minerals are important for strong bones and teeth, but are also needed for normal muscle tone and fluid distribution. Vanilla as a mood enhancer: Vanilla extract has a long history of use in the Americas not only as a flavoring, but also as an aphrodisiac, sedative, antidepressant and sleep aid. The ability of vanilla extract to affect hormones of the body and neurotransmitters of the brain is not well established by scientific studies, although many decades of anecdotal claims make it an intriguing possibility. Many other herbal remedies, such as Valerian root, chamomile and passion fruit, are proven to alter mood, so the potential certainly exists for vanilla bean. To stew add chopped rhubarb with ¼ – 1/3 cup of water, one tablespoon of desired sweetener (I used sucanut), ½ teaspoon vanilla and a generous sprinkle of cinnamon. Bring all ingredients to a boil and then lower to a simmer and let simmer for 15 – 20 minutes. Let the rhubarb cool to room temperature then chill in the fridge. Add all the smoothie ingredients to your blender. Blend and enjoy. Homemade nut milk is super easy to make and so much tastier and fresher than store bought nut milk, as well as healthier. 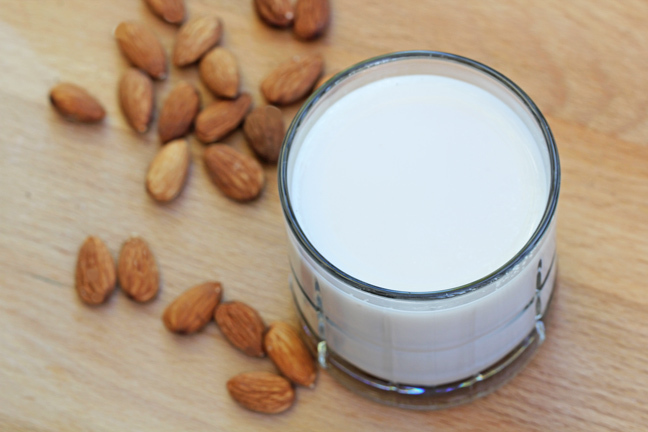 Store bought nut milks are usually pasteurized and have added preservatives and sweeteners to increase shelf life. Another great advantage to making your own nut milk is that you get to personalize the texture and flavor of the milk and create a version that’s uniquely all your own by adding dates, cinnamon, maple syrup, blend on high, blend on low…whatever you want to make it yours! The hardest part about making your own nut milk is remembering to soak the nuts before heading to bed or before heading out for work. So simple! Let’s get blending! 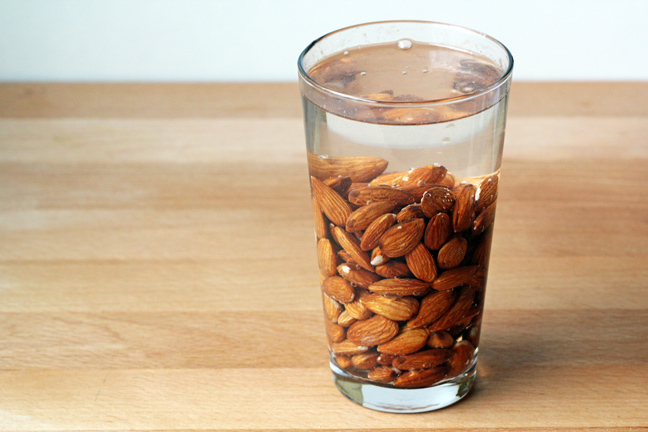 Begin by soaking your nuts in water for about 8 – 12 hours. Drain water and rinse the nuts. Add nuts and 4 cups of water to blender. Blend for about a minute. If you want a smoother milk, strain the milk using a cheesecloth or nut milk bag. Store the milk in a jar and keep refrigerated. It will last for up to 4 days. If you’d like to add some sweetness or other flavor, experiment with adding dates, vanilla, cinnamon, agave, or nutmeg. 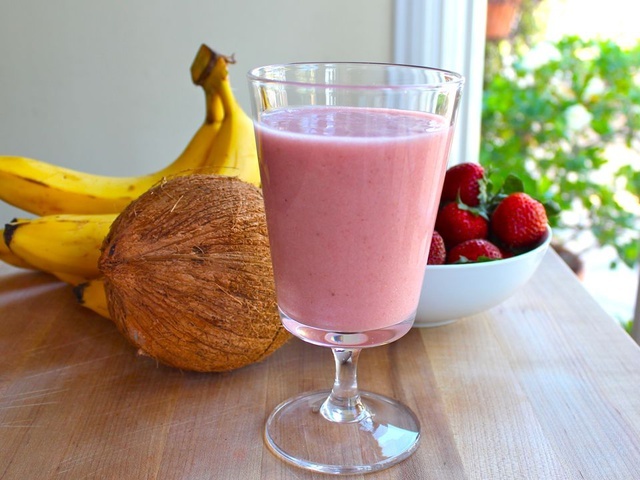 To use dates, once you have strained the milk, put it back in the blender and blend until smooth and creamy. Also, if you strained your milk, save your nut pulp and use it in oatmeal, smoothies, baked goods, or raw dips! Sky’s the limits with nuts!! That’s why we’re nuts about nuts! There’s no better way to start your day than with a taste of the tropics. This fruity and refreshing smoothie will even have the groggiest of early risers smiling and moving through the day with an extra bounce in their step. 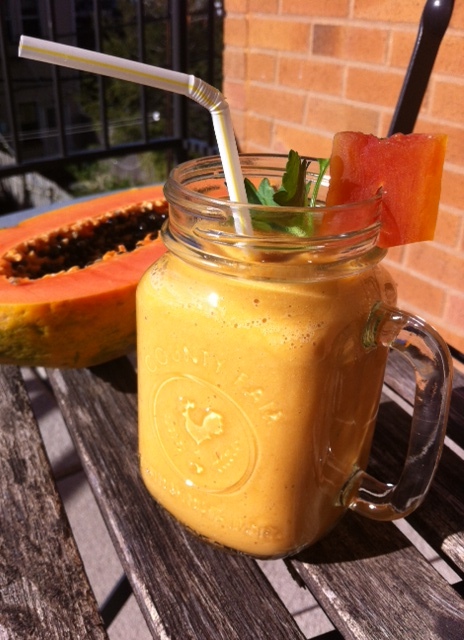 The shining star in this smoothie recipe is papaya. Papaya is a rich source of antioxidants, phytonutrients, vitamins, minerals and special digestive enzymes that have a remarkable effect both internally and externally. If you’d like to improve your skin, relieve digestion problems, protect your eyes and heart then consider the many benefits of eating papaya. Ripe papaya is a great source of antioxidant vitamin C, vitamin E and carotenoids like beta-carotene and lycopene. The high levels of these nutrients can help protect your skin against free radicals known to cause wrinkles and other visible signs of aging. 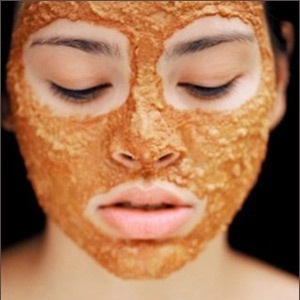 The enzyme papain in the flesh and skin of the fruit actually breaks down dead skin cells and helps promote skin renewal when used topically on the face or body. Using papaya topically, as scrubs or cleansers can improve your skin’s texture, elasticity and appearance. Along with its beta-carotene content that can be converted to vitamin A, which is extremely important to eye health and vision, papaya also contains the carotenoids lutein and zeaxanthin. Lutein and zeaxanthin, known as xanthophylls, are concentrated in the macular region of our eyes. Here they provide protection against high-energy blue light that can damage our retinas. The high levels of lutein and zeaxanthin in papaya may also protect us against developing cataracts, glaucoma, and other chronic eye diseases. The high levels of vitamin C and E along with antioxidants like beta-carotene and lycopene found in papaya can help reduce the oxidization of cholesterol in our arteries. Cholesterol oxidization is considered a dangerous process, potentially leading to arteries blocked with plaque that can result in heart attacks. Increasing your intake of these antioxidants from health foods like papaya may help improve blood flow to the heart and reduce your risk of developing heart disease. Papaya is a good source of folate, which can help control high levels of homocysteine found in the bloodstream – another warning sign of potential heart-related illness as high levels of homocysteine in the blood are known to damage blood vessels making them difficult to properly circulate through the body. The enzymes in papaya, and especially the green fruit, can improve digestion by breaking down proteins into their individual amino acids. Undigested proteins can lead to health issues such as gastrointestinal problems and an overgrowth of flatulence causing bacteria in the colon. 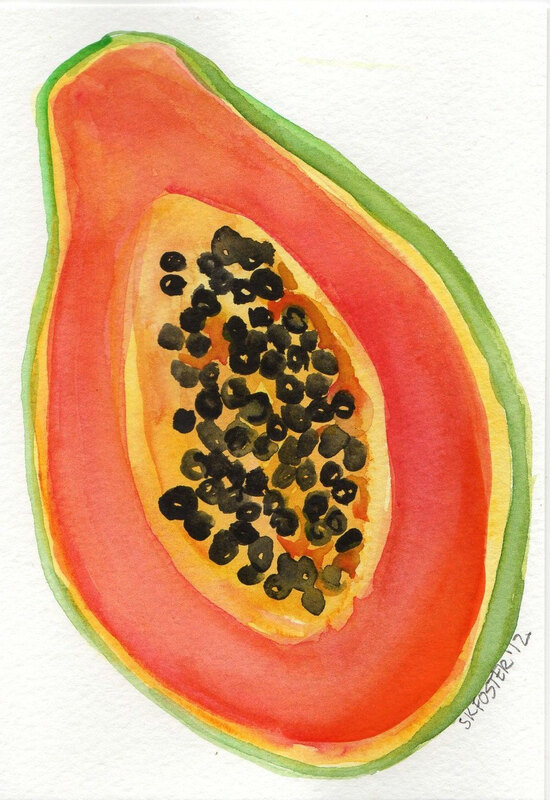 The proteolytic enzyme papain found in papaya is extremely efficient at breaking down proteins and restoring healthy bacteria in our gut. The seeds of papaya are believed to have an antibacterial and anti-inflammatory effect on our digestive systems. Studies have shown an extract made from them is effective at killing E coli, Salmonella, Staph and other dangerous bacterial infections. Recently I had the good fortune to visit the beautiful country of Sweden. 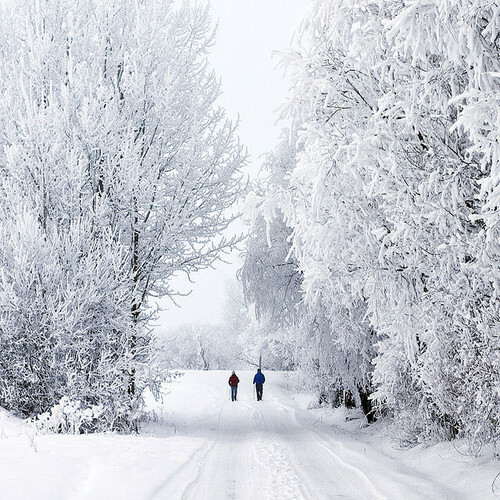 Instantly, I was overcome by the natural beauty of my surroundings, it was love at first sight. However, I am not a winter person by nature, and I would probably have faired better during the summer months, not February. In any case, there I was, in the Artic Rim, mid-February having just come from Goa, India. I rocked off the plane in flip-flops, a tee & jeans, it was -10 Celsius in Stockholm, mild in comparison to where I was heading. I thought to myself “oy, mandatory shopping was in order” but that would be no problem, shopping is always an easy to-do for me and coupled with the kindness of many friends along the way I started to accumulate a Parka, socks, boots, hats, gloves, scarves, and hideous hand me down sweaters that proved to be necessary for survival, as well as local handmade honey. As I started to warm up I couldn’t help but think “what the f*ck I am doing here, it’s so f*ing COLD! However, crazily enough and difficult to admit, I grew to love the climate, it was surprisingly good for my skin, and my lungs felt released of all the heat and humidity stored from Asia, it was as if I could feel my Pitta fire burning out and cooling down. I acclimated quickly and took to the great outdoors. I have taken away many fond memories from Sweden. The things that stand out the most include a Swedish word or two, road trips, wishing I had taken more pictures, vortexes, sauna world, caviar, windburn, a deep love for all of those that shared the journey with me, and of course, Chaga, a fascinating super herb that I can’t seem to get enough of. I will always cherish the lovely people who I was lucky enough to meet during my travels, especially my friend Magnus who introduced me to the medicinal mushroom known as Chaga that grows on the gallant white birch tree indigenous to the area. 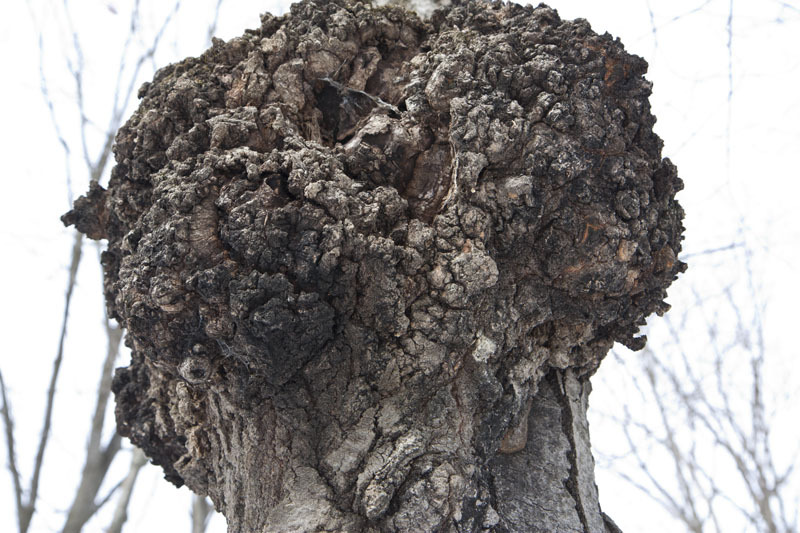 Chaga appears as a black charcoal like growth that emanates from the white birch tree. I had never heard of it. We decided to go out and explore and forage for Chaga. Our mushroom hunting ended abruptly when surprisingly enough there was some Chaga growing on one of his beautiful birch trees right in the middle of the front yard. I couldn’t believe our luck. This was no short of a miracle, as Chaga is not that prevalent. February is probably not the best time for harvesting Chaga, it would have more easily come off of the tree if thawed by the summer sun but none-the-less we eventually sawed it off let it thaw and eventually grounded it up for tea. The Chaga was an earthy tasting concoction that I have been consuming daily ever since. I have been exploring it in a variety of different ways in my test kitchen. My interest was instantly peaked on this super herb and after a little research I was astounded by the myriad of health benefits claimed by this ancient medicinal mushroom residing primarily in the Northern Hemisphere. I continue my research, reading everything I can find on the subject. I always keep a batch of Chaga tea in the frig to cook with, whip up a smoothie or just enjoy it on its’ own. Here are some interesting factoids on the fungus. Chaga is known as the “King of Medicinal Mushrooms.” Different from other mushrooms, as it is densely configured with antioxidant pigments. In fact, Chaga is the most nutritionally dense of all tree growths. Unlike common mushrooms that are soft, Chaga is hard, wood-like, and at it’s core has an almost cork-like quality to its’ appearance. Many references from numerous ancient cultures have called it the “Gift from God” the “Mushroom of Immortality” the “Diamond of Life” and even the “King of Plants” from the Chinese, which is a strong statement from a culture where plants and herbs are the backbone of their traditional medicine. Chaga is a natural BRM (Biological Response Modifier). It not only stimulates the body’s immune function when necessary, but can also slow it down when it’s overactive. In short, it will normalize the immune function, what classifies Chaga as an adaptogenic. The beta-glucans appear to be mainly responsible for that property, but many researchers believe it is actually the synergy between several, if not all constituents that is responsible for the full range of this adaptogenic action. Because of this property Chaga can be used to neutralize the side effects of pharmaceuticals, to compensate the age-related decline of our immune function, to neutralize genetic immune-disorders (like many auto-immune diseases) and, in general, to help us to deal with all the stresses of modern life. Stress (mental, physical, chemical, environmental – the change of seasons, urban life, pollution, etc. ) has an enormous negative impact on our resistance. Chaga has proven to be very effective in supporting standard cancer treatments such as chemo-therapy and radiation. It can compensate the devastating effect these treatments can have on the immune system (causing side effects like nausea, insomnia, poor appetite, fatigue, etc. – these side effects are often the result of a compromised immune function.) It helps preventing metastasis (cancer cells traveling through the bloodstream should be neutralized by the immune system before they can cause harm). Chaga can significantly contribute to the quality of life during and after treatment this way. Furthermore, research indicates that Chaga itself also has anti-cancer potential, in particular during the early stages of cancer. The betulinic acid and some of the phytosterols present showed the ability to kill cancer cells directly. How this works exactly is the subject of several theories. So Chaga has both an indirect (by stimulating the immune system to battle cancer-cells) and direct (by causing apoptosis [=programmed cell death]) effect during cancer treatments. Anti-tumor activity was only found in extracts prepared by lengthy heating or decocting, infusions prepared by steeping the raw material where not active against the tested tumors. A high quality extract should include the sclerotium ( the black outside layer ) of the Chaga. This is important, because this sclerotium contains a massive amount of a specific fungi-melanin, giving good extracts a very high level of anti-oxidants and turning Chaga into a powerful anti-aging tool. Research showed DNA-regenerating and re-vitalizing properties. 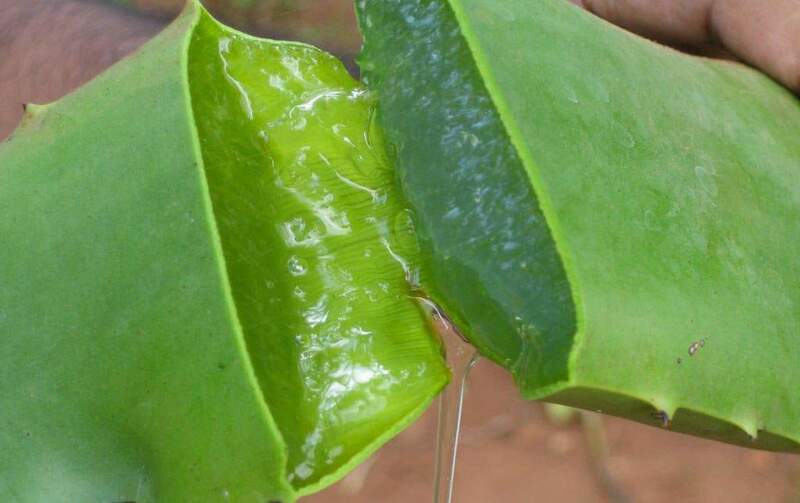 The whole body will benefit from this; you will look better (skin and hair) and your organs will function better. One of the many benefits of using a full-spectrum Chaga extract is that it has no side effects at all. Chaga is merely stimulating the body to heal itself. There is no potential disturbance of the body’s chemical and hormonal balance. This makes medicinal mushrooms like Chaga the ideal supplement for everybody. The only contra-indication is immune suppressing medicines (e.g. cyclosporin containing products, used after a transplant). Never use medicinal mushroom extracts together with this type of medication – the immune modulating effect might neutralize its workings. In addition, Chaga contains numerous B vitamins, flavonoids, phenols, minerals, and enzymes. It is also one of the world’s densest sources of pantothenic acid a vitamin needed by the adrenal glands as well as digestive organs. It also contains riboflavin and niacin in significant amounts. Chaga contains wild-source minerals and is particularly high in copper, calcium, potassium, manganese, zinc, and iron. Yet, its most potent ingredient is a special substance known as superoxide dismutase (SOD). This is an enzyme with great potency. Its function is to halt oxidation, especially the toxicity of a free radical known as singlet oxygen. This is the type of oxygen responsible for oxidizing and damaging tissues, which results in aging. It is the same oxygen that rusts a nail. SOD blocks this damage by quenching the singlet oxygen free radical. The SOD content per gram of Chaga is exceedingly higher than any other antioxidant currently known. Like to the tune of 50,000 x’s higher. If you live outside of the Northern rim or don’t vacation mushroom hunting in Siberia, you can source Chaga on the web. Not all products are created equal, and I have only used my own wild harvested Chaga to date. I am however a fan of David Wolfe, and he sells Chaga in a variety of different forms on his website www.longevitywarehouse.com Again, I have not tried his Chaga and I do not recommend anything that I haven’t loved, touched, tried and enjoyed. My experience with Chaga thus far has been an adventure of wonder, fascination and great joy, I can only hope to have peaked an interest in you about the many benefits of Chaga. Try Chaga today. You can count on the fact that in the future we will be sharing Chaga recipes that earn our respect in the test kitchen. Here is one I have been exploring & really like. Blend until smooth & creamy. Enjoy & Happy Mushroom Hunting! *Tastes like apple pie. With cacao added it has more depth.